Let’s Sing&Grow is a CD designed specifically to bring families together: for kids, parents, brothers, sisters, friends, aunties, uncles, neighbors and grandparents everywhere to share time, fun, creativity, a little bit of silliness and a whole lot of joy. This CD includes 18 tracks and a lyric booklet within the cover. - Price excludes shipping. GST will be added at checkout. Let’s Sing&Grow is a collection of songs designed specifically to bring families together: for kids, parents, brothers, sisters, friends, aunties, uncles, neighbors and grandparents everywhere to share time, fun, creativity, a little bit of silliness and a whole lot of joy. If you choose this option, you will receive a DROPCARD in the post. This DROPCARD gives you access to download the 18 tracks as MP3’s and lyric booklet as a PDF. Sing&Grow Together: Music Through the Day is designed to arm parents and carers with a variety of musical ideas to make the undertaking of daily tasks with young children an easier and more enjoyable experience. Let’s Sing&Grow is a CD designed specifically to bring families together: for kids, parents, brothers, sisters, friends, aunties, uncles, neighbors and grandparents everywhere to share time, fun, creativity, a little bit of silliness and a whole lot of joy. This Digital Album includes 18 tracks and a digital booklet. - GST will be added at checkout. 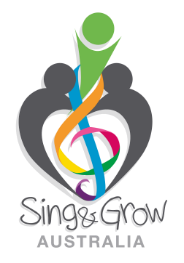 Let's Sing&Grow, from the latest Sing&Grow CD – “Let’s Sing&Grow"
Row Your Boat, from the latest Sing&Grow CD – “Let’s Sing&Grow"
Busy Body, from the latest Sing&Grow CD – “Let’s Sing&Grow"
Clap Your Hands, from the latest Sing&Grow CD – “Let’s Sing&Grow"
Play Music Together, from the latest Sing&Grow CD – “Let’s Sing&Grow"
Bop and Stop, from the latest Sing&Grow CD – “Let’s Sing&Grow"
Pack Away Time, from the latest Sing&Grow CD – “Let’s Sing&Grow"
Rock 'n' Roll Band, from the latest Sing&Grow CD – “Let’s Sing&Grow"
Inanay, from the latest Sing&Grow CD – “Let’s Sing&Grow"
Counting Rap, from the latest Sing&Grow CD – “Let’s Sing&Grow"
Aussie Animal Groove, from the latest Sing&Grow CD – “Let’s Sing&Grow"
Rainbow Ribbon Dancing, from the latest Sing&Grow CD – “Let’s Sing&Grow"
Bounce, Rock and Roll, from the latest Sing&Grow CD – “Let’s Sing&Grow"
Peek-a-boo, from the latest Sing&Grow CD – “Let’s Sing&Grow"
Heart Song, from the latest Sing&Grow CD – “Let’s Sing&Grow"
My Little Teddy, from the latest Sing&Grow CD – “Let’s Sing&Grow"
Twinkle Twinkle Little Star, from the latest Sing&Grow CD – “Let’s Sing&Grow"
Little One, from the latest Sing&Grow CD – “Let’s Sing&Grow"